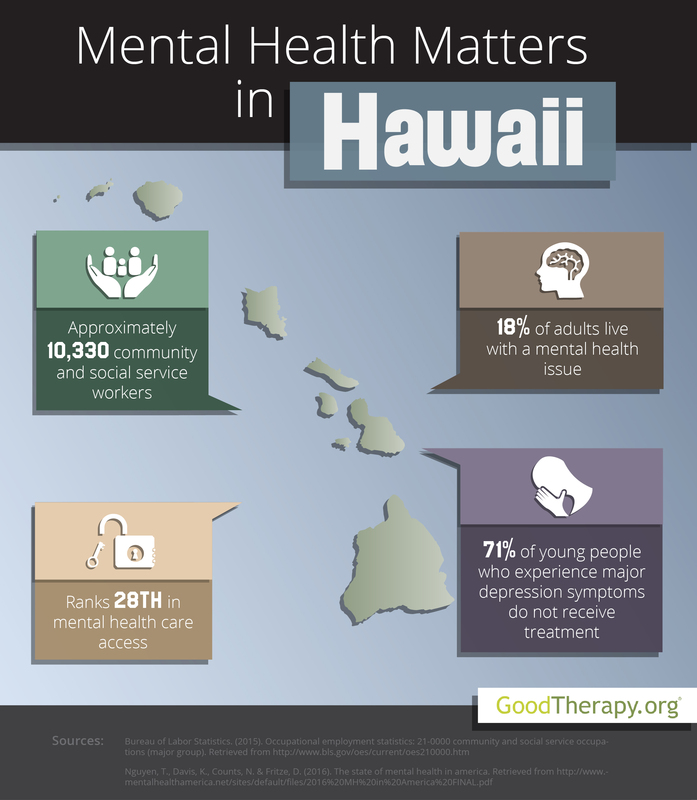 Find a therapist in Hawaii with GoodTherapy.org. Statistics from the United States Census Bureau show Hawaii was home to approximately 1.4 million people in 2015. For that same year, the Bureau of Labor Statistics (BLS) states that about 10,330 residents were employed in community and social service fields. Typical professions within this group include vocational counselors, parole officers, depression treatment therapists, child psychologists, marriage and family therapists, and counselors at residential treatment centers. In Hawaii, these workers earned an average yearly salary of $49,240. Mental Health America’s (MHA) 2016 survey on the state of mental health in the country gave Hawaii an overall rank of 22nd—falling somewhere in the middle of all 50 states plus the District of Columbia. In addition to receiving an overall mental health rank, the states were also ranked by specific mental health access and treatment measures. Among the major categories, Hawaii was 5th in adult ranking, 51st in youth ranking, 30th in prevalence of mental health issues, and 28th in access to care. These rankings indicate a large divide between adults and adolescents. In general, adults in Hawaii have a low rate of mental health issues plus a high rate of access to care, while younger people have a high rate of mental health issues with a low rate of access to care. Hawaii’s overall rankings in prevalence and access are mostly mid-range. Hawaii’s relatively high adult ranking was dependent on several factors. According to the 2016 MHA survey, Hawaii has the lowest percentage of adults who experience mental health issues who reported unmet need, the fourth-lowest percentage of adults with a disability who could not see a doctor due to cost, and the fifth-lowest percentage of adults with psychological and emotional issues who were uninsured. Even with the top ranking among adults reporting unmet need, Hawaii was ranked second to last for adults with mental health issues who did not receive treatment. While Hawaii was among the top five states in adult ranking, it was last in youth ranking. Data from the 2016 MHA report states almost 7% of young residents experience substance abuse or dependence on drugs or alcohol—giving the state a rank of 48th in this category. According to the Substance Abuse and Mental Health Services Administration (SAMHSA) in 2012-2013, 78% of young people in Hawaii perceived no significant risk in smoking marijuana once every month—higher than the national percentage. Researchers are also concerned about depression among young people as well as the effectiveness of mental health services in the state. Among teenagers with symptoms of major depression, almost 71% did not receive mental health services; only 19% received consistent depression treatment. The state was ranked 44th and 38th in these respective categories. Hawaii was ranked 51st for children who had private insurance that does not address mental and emotional issues. According to Mental Health America, children in Hawaii are 10 times more likely to be uninsured than children in Connecticut.